Here is a brief description of the recent Baker Island (KH1/KH7Z) 160-meter operation. Among the numerous limitations the USFWS placed on us, being only allowed on the island in June was the most onerous. A long way from ideal from a low-band point of view, but we were determined to make it work. The result was over 1500 QSOs on Top Band. The location of the 160m TX antenna was close to the north-west corner of the island, but not as far north and clear of the land as we would have liked it. Also, we were not able to place our TX antenna fully in the water, due to the pounding surf. (Which did destroy our 80 m antenna the first night.) Instead, the 160m TX antenna stood just at the high tide water-line, with the metal base buried in wet sand. At low tide the antenna base was 30 feet from the water’s edge, but fortunately the sand below the antenna was always saturated with salt-water. Luckily, the tide was mostly up around the times we were working NA on TB. We were only allowed a maximum antenna height of 43 feet. To meet this requirement, we designed a “fat” 160m vertical, which had three vertical wires, two of them on spreaders to make the apparent diameter of the vertical conductor larger. The antenna also had two 12.5m top-loading wires, which sloped down at 45-degrees. The antenna had 8 radials of various lengths, with three of them going directly into the salt-water. Takeoff to the west and north-west was clear over open water, but to the north-east (towards NA) it was over land, with a 20’ high sand berm directly inthe way. The antenna was fed via a remote-controlled coupler. I want to point out that even this simple, and far less than ideal, arrangement took a tremendous effort to build, as we had to haul the all the gear for the CW tent about ¼ mile from the boat landing, working in 100 degree heat under the Equatorial sun. Transmitter power was around 800 W (but occasionally reduced 400 W to leave more generator power for the other bands). 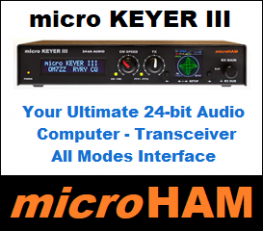 The radio was a K3S. Receive Antenna: After the second night of operation we built a 60 foot long DHDL facing north-east. The antenna had a high-performance filter/pre-amplifier. After the fourth night we added a second DHDL that faced towards Europe. We were expecting easy conditions for JA (who were closer) and difficult for NA. We got the opposite.The band would open to NA soon after our sun-set (around 18:00 local time) with very little noise. NA callers were initially weak but easy copy. Noise would start rising about two hours after sun-set. Fortunately, that was about the time the gray-line was reaching the East Coast, which brought up the signals well above the noise. Some East Coast signals were quite loud. As the evening progressed, noise continued rising as more of the equatorial thunderstorms to our west came under darkness. By the time the JA-s would show up (about 5 hours after our sun-set) noise was way up, and receiving conditions were becoming difficult. Still, some West Coast stations kept coming in strong, well over the noise, and quite able to work among the numerous JA callers. Occasionally, we had to listen up for NA above 1825.00 to avoid the JA QRM, but on the long run that proved to be unnecessary. Overall, working NA was a pleasure, while working JA (and SE Asia) was a pain due to the noise. By midnight local timethe lightning crashes on the TX antenna were becoming painful. Later, the DHDLRX antennas would help, but even then, many signals were a better copy on the TX antenna. Almost every call was different, some would be strong and clear on the TX antenna, while others could only be copied on the RX antenna. There was also a large variation in RX conditions from night to night. On our second night the noise was much higher than on the first night. Also, as we were working progressively weaker stations, things were getting harder. Although we knew that the chances for working western EU were basically nil, we made a big effort to work as far west possible. On most mornings the noise was just too much to copy anything below S7. A few nights, however, conditions were favorable, and we got as far as European Russia. Conditions were the best on our last night, when just at sunrise we got as far west as Serbia, with numerous Russian and Ukrainian stations also logged. (Remember, this was in July!) After operating 7 straight nights on 160, my ears were ready for a break. We switched to FT8 for about 5 hours, using the regular QSO mode (not hound-and-fox). With N1DG operating, we made about 120 NA QSO-s in about 5 hours! Just before midnight, we switched back to CW for the JA-s, who are not allowed to operate FT8 in the lower part of the band. The FT8 operation revealed three things: There is serious demand for FT8 on TB, the mode gets through the noise very well and gives modest stations a chance to work serious DX on TB, but it is easily dominated by the strong signals. An interesting lesson from what happened to our 80 meter antenna. Initially, it stood on a sturdy metal base in the water. During the first night we had a storm and the surf broke up the base (snapping ¼” bolts like they were matchsticks). The surf knocked the antenna down and soaked the tuner with salt-water. The next morning, we rebuilt the antenna further up the beach, but without the metal base which originally connected it to the salt-water ground. Although we added a good number of radials, performance was poor, especially when compared to the 160 m antenna,whose metal base was in contact with the salt-water below. 1. 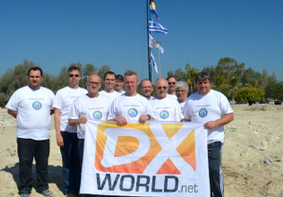 160 m DX is morethan possible in June and July. 2. For good results, you must be on the band every night, otherwise you may miss that special night when the conditions line up just perfectly. 3. A salt-water ground helps, and where possible, vertical antennas should stand in the water. Being up the beach is not the same. 4. 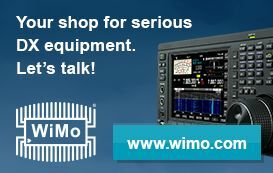 RX antennas are needed to work the weaker stations. 5. 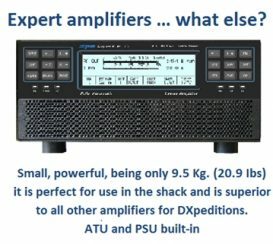 DXpeditions should have a station dedicated to 160 m (at night) with operators who want to work 160. 6. 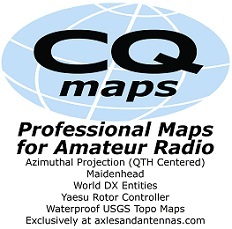 FT8 is now part of Amateur Radio, even on TB.